Active Protocols: A-712 is to be kept at Site-002 on a mannequin display head in a 1.7 meter by 1.7 meter display case when not in use for experiments or personnel protection. Due to the anomalous properties of A-712, personnel are allowed to wear it with permission from one Level 3 researcher if an experiment involves the possibility of ballistic damage to the head. 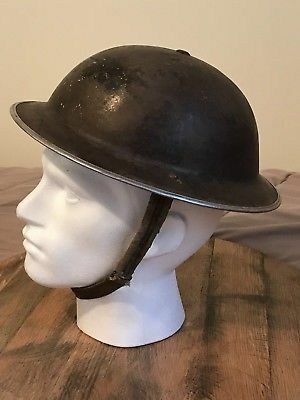 Description: A-712 is a British "Brodie" steel helmet manufactured in 1940. A-712’s anomalous properties are consistently present even when no one is wearing it. A-712 appears to be immune to all conventional ballistic damage up to .50 BMG (see Test Log 712-1), as well as some, but not all non-conventional ballistic damage (See Test Log 712-2). A-712 is not immune to large explosives (See Test Log 712-2). A-712 does, however, exhibit signs of general wear, with minor pre-existing dents possibly caused by shrapnel or debris, and a non-removable mud stain near the back of A-712. A-712 is different from regular steel upon tests of the metal composing the helmet. It appears to be constructed of an alloy composed of mostly iron, with titanium, platinum, gold, and some unidentified metals (See Test Log 712-3). A-712 has a name, William █████, written on the leather inside, however, records show that this was not the name of the P.O.W that originally possessed the helmet. Below that, "God Save The King!" is written. Due to A-712's anomalous property to completely absorb the energy of bullets (See Test Log 712-4), the Initiative is currently testing the applications of a replicated material as body armor. (See Test Log 712-5). After its previous owner was captured by German soldiers in 1943, A-712 was intended to be used for target practice by the 1st Infanterie Division, the occupiers of the Stalag ███-█ P.O.W. camp. A German Soldier named █████ ██████ fired at it, and was surprised when the bullet did not damage the helmet. He wrote about A-712 in his journal. “I shot at the helmet. Nothing happened. I heard a ding, but it is like the bullet vanished…”. A-712 was obtained when American soldiers liberated the Stalag ███-█ P.O.W camp in 1945. One of the American soldiers could speak German, and read the journal out of curiosity. The soldier decided to test the statement recorded in the journal, and then searched for the helmet mentioned in the journal. He shot every captured helmet until he eventually "stumbled upon" A-712 and fired at it. He was surprised to see that A-712 was, in fact, anomalous. After discovering A-712 and the journal entry, A-712 was sent to the American government, who did testing of their own, and later to the Initiative with video evidence of A-712's anomalous properties. Tests on A-712 were stopped until 7/6/1984, due to lack of caliber variety at the disposal of the Initiative. Effect: Dent left on A-712, no critical damage to its structure, however. Effect: No damage besides previous dent observed on A-712. Weapons used: Beretta 92, Smith and Wesson 686, Colt M16A2, Simonov Sks, H&K G3, Dragunov SVD, and Remington 870. Effect: No damage besides previous dent observed on A-712. Conventional Ballistic Tests concluded. Effect: Minor dent left on A-712, no critical damage to its structure. Effect: Very small dents left on helmet. Burn marks from previous test cleaned up. No larger explosive calibers are to be used, due to fears of Neutralizing A-712. Effect: No damage besides previous dents observed on A-712. Effect: Miniscule dent left on A-712. Effect: The rifle was purposely aimed at the left side of A-712. A small piece of the out-most diameter of A-712 chipped off. Effect: No damage from the 9mm rounds observed on A-712. Non-Neutralization confirmed. The chipped piece of A-712 was scanned with a Metal Composition Analyzer, showing 4 existing known elements, with 3 unknown elements. The elements were Iron, Platinum, Gold, And Titanium. The 3 unknown elements were analyzed for their composition, showing no amounts of anything on the periodic table present, except for the second unknown element, which included trace amounts of Uranium. A-712 was placed upon a scale and filmed by thermal imaging cameras. Researcher █████ was assigned to fire at A-712 with a Beretta 92FS, the baseline testing gun. █████ fired at A-712 five times and then proceeded to observe the effects. The thermal cameras showed the footage of the bullets hitting A-712, and then vanishing, with the energy being completely absorbed by A-712. The scale showed no change in mass. After the results of 712-4, the Initiative saw the potential of A-712 replication-based body armor. The chipped piece of A-712 was examined once more, with researchers noting every detail of the unknown elements. Many replication materials were tested, with tests still ongoing. The first replication material was made into an armor plate and inserted into a standard security vest. A D class was assigned to put on the vest. Researcher █████ Fired a single 9mm round at the vest. The replication material instantly shattered, fragmenting inside of the D class. the D class was declared dead moments later. The second replication material was made into an armor plate and inserted into a standard security vest. As with before, A D class was assigned to put on the vest. Researcher █████ again fired a single 9mm round at the replication plate. The bullet initially did no damage to the plate or the D class, but, it burst into flames exactly 5 minutes and 41 seconds after, burning the D class alive. The third replication material was made into an armor plate and inserted into a standard security vest. As with the other two tests, A D class was assigned to put it on. Researcher █████ fired a single 9mm round at the vest. The D class reported pain. the vest was taken off and inspected. The tests showed identical results to ones of a ballistic vest with an AR500 steel plate inserted. The D class was sent back to his cell, unharmed. The fourth and final (As of 4/21/2016) replication material was made into an armor plate and inserted into a standard security vest. as with the other 3 tests, A D class was assigned to put on the vest. Researcher █████ fired at the vest with a single 9mm round. The D class reported slight pain. The vest was taken off and inspected. The fourth replication material showed better resistance results than any military or commercially available armor plate, and production of this material is slated to begin if a better alternative is not found.